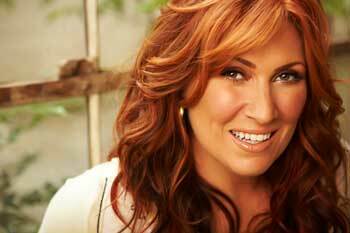 Jo Dee Messina Comes To Glens Falls With Racin' & Rockin' Country Music Concert! GlensFalls.com had the opportunity to chat with Jo Dee Messina, country star and featured performer at Infield Parking's Racin' & Rockin' Country Music Concert that hits Glens Falls, NY for one night only on August 21, 2010. GlensFalls.com: Have you ever been to upstate New York? What are you most looking forward to when you get here? Jo Dee: Oh, Yeah!… Waterbury, Albany, a bunch of places. I'm mostly looking forward to the weather... it's been hot in Nashville! GlensFalls.com: Your album 'Unmistakable: Love' was just released this past April, has it been everything you've expected it to be? Jo Dee: The album itself turned out great! It was in progress for awhile, so I would liked to have completed it in a shorter span of my life, covering less. But it took 6 years to release, so it covers a whole realm of stuff. We are releasing it in three segments. GlensFalls.com: Infield Parking brings together Country Music and NASCAR. Are you a NASCAR fan? Who is your favorite driver? Jo Dee: Yeah, well since I've had my son I haven't had as much time to watch, but before that we watched it every Sunday and Busch races on Saturday. We've played at Talladagea, which was so cool. Country music and NASCAR are a natural fit. A favorite? Nope, I'm not allowed to claim a favorite. GlensFalls.com: What do you do in your spare time when you are not performing/touring? Jo Dee: I have a son, so for the last 16 months I am with him any spare moment I have. He comes on the road with me all the time - him and my husband tour with me. Jo Dee: It is a little bit of a hiatus - it's an hour long show for the fans, by the fans, where they submit topics, birthdays, shout outs, questions, and everything - it's totally created by the fan. Sort of like a mindless hour where we show videos and tell stories. People call in on the topic of the day, my favorite was 'what happens to socks in laundry?' Nobody knows where they go! It is also just another way for me to keep in touch with fans. GlensFalls.com: Can you tell us a little bit about your "Music Room Series" acoustic tour? What is different about this tour than other tours? Jo Dee: We go out in the fall with Broken Down Acoustic Tour. It's very fan interactive. The stage is designed like the music room in my house - it's a place where we can all gather around, share stories, and play some music. It's a show that can't be held in arenas. GlensFalls.com: Describe yourself in three words. Jo Dee: Passionate. Empathetic. Loving. GlensFalls.com: What is something fans might not know about you? Jo Dee: They know everything! A fan even called the cable company on my behalf during a podcast when she knew it wasn't working... I guess one thing they might not know is that I don't get enough sleep. GlensFalls.com: What is the best part about touring? GlensFalls.com: What is the worst part about touring? Jo Dee: The horrible routing - the booking agents don't own a map! It is grueling to get from show to show. GlensFalls.com: What songs can concert-goers look forward to hearing live at the Glens Falls Civic Center for the Racin' and Rockin' Music Concert? Jo Dee: I'm doing the hits people know, but trickling in some new songs from the 'Unmistakable' record. Then if they hear a song they like, they can walk off with album. I want to keep it so people dont get bored, but still sneak some new stuff in there. GlensFalls.com: Have you decided what you are going to wear for the concert? Jo Dee: Nope! I just grab jeans and a t-shirt out of the suitcase and go. GlensFalls.com: What is your favorite song to sing live? Jo Dee: Don't have one. It depends on the day and what the audience responds to. GlensFalls.com: What is your motivation and drive to perform? Jo Dee: The music and the fans. We will be so exhausted, but when you walk out on stage adrenaline starts flowing and they give you energy when you don't have any. It is like people cheering for you during a race - it makes you keep on running! Read more about the Racin' & Rockin' Country Music Concert. GET YOUR TICKETS TO SEE JO DEE MESSINA & OTHERS LIVE AT THE GLENS FALLS CIVIC CENTER!